It is clearly evident that US figures in the TOP of the list with 14 Trillion $ economy. The closest is Eurozone or the “European Union”, which is actually a union of many European counties, so it cannot be considered as a “one entity” and has been excluded from the rankings. So, effectively, Japan is the 2nd country in the list with close to 5 Trillion $ economy. The difference, is 9 Trillion $. About 200 years ago, India or rather the Indian-subcontinent had the largest economy in the World. Now it ranks 12th. So what did the US do to come to the Top of the list ? Looking into the annals of the period of its independence, we see its conditions were similar to what other countries suffered during independence. Nor there is any clarity in the argument that they’ve had adequate time to develop and grow given that they got independence in the 18th century, because that would contradict the fact that United Kingdom was never even captured for a millennium and around half of the world (including both India and US ) were under the U.K. territory at not-so-long-ago point in the history. So then what is the arcane recipe to affluence they’ve got ? The answer is, an amalgam of Debt as Money and the “Globalized” Dollar. 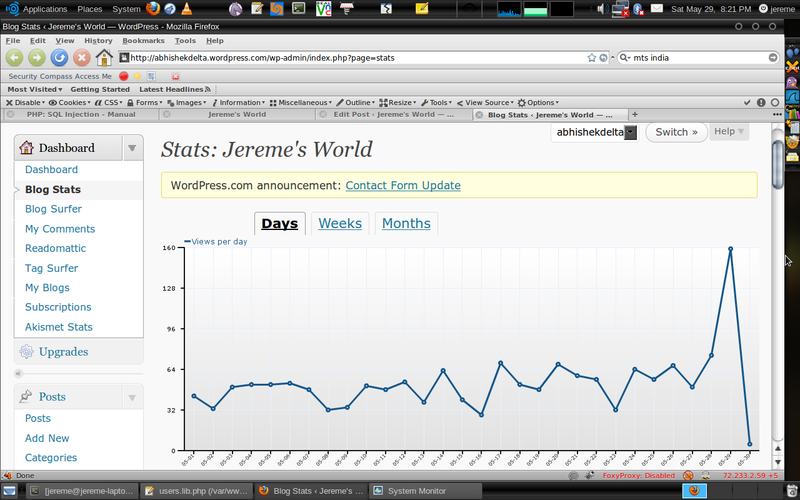 Wow, did any one had such a blog statistics graph in WordPress ever ? I have no idea about the reason behind it. Remember the day, 29 May 2010 ! Recently I found something very shocking in Google Maps. As you all must be aware of, Google Maps Application is not the same for all the countries. There’s a different version of it for USA, for India, for China and for other countries in which Google has a center. By default you’re shown the Google Maps for the country you reside in. But what no one knew till now is that Google is showing different maps specifically of India in different versions of Google Maps! Moreover, in case of China, it shows a major part of J&K and the entire Arunachal Pradesh as a part of China, within the border line of China. Now that is something very daring! Goto http://ditu.google.com and Don’t Panic! I can only say, what the hell is this ? I think it is not safe for Google to play with such politically sensitive issues. I don’t know whether our country politicians are aware of it. I agree there is a political dispute over these regions but there should be a global consensus built upon it to agree to a common conclusion atleast for the time being. Recently, it was in News that China is issuing VISAs differently to citizens of J&K and not like the ones being issued to Indians from other states. Such moves by China are only aggravating the tensions between the two nuclear powers. Although, even India doesn’t hold a clean chit for it allowed Dalai Lama to visit Arunachal Pradesh just before the elections despite strong protest from across the border. If these trends continue, I fear the relationship between India-China will soon become like that of India-Pakistan. China won’t lose much, but India cannot survive with enemity with both of its major neighbours. But I doubt personally that Google did this intentionally. May be even Google is used as a pawn in this complex maze of international political chess, played by USA, China and India. If the Chinese government forces, Google will have no option but to adapt to the maps provided by Chinese government or else face a ban (which google can’t afford in China) and same is the case with Indian Government and US Government. After all, Google is just a profit-minded software company! It certainely has no interest in world politics and It only does whats best in its own interest. If someone is responsible, its the governments.